Tesco has decided to stop selling small, lunchbox sized versions of Ribena and Capri Sun juice drinks, in an attempt to help customers ‘make healthier choices’ and to tackle the serious issue of childhood health. The decision, naturally, has split opinion. Health campaigns have of course reacted positively, praising the removal of drinks that are heavy on sugar content. Others have been more derisive, accusing the retailer of hypocrisy, as it still sells drinks such as Coca Cola, while the issue of free choice has been raised by others. In January of last year, we asked parents how many drinks of fruit juice their children had per week. Almost a third (32%) said their children have one per day. However, just fewer than six in ten (59%) normally check the sugar content on the label of a product. YouGov BrandIndex data underlines the impact the removal of those products could have on the brands. 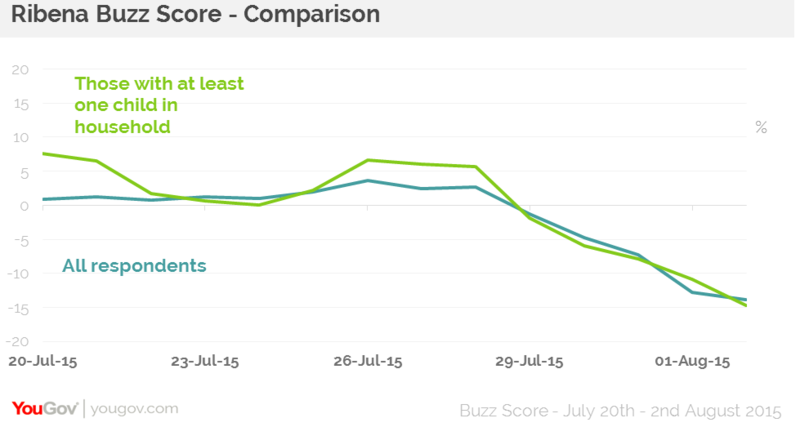 YouGov’s Buzz score, which measures whether a person has heard positive or negative news about a brand in the past two weeks, shows a decline for Ribena. Among all respondents Ribena’s score has dropped from 0.8 to -13.9. More pertinently, among those with at least one child in their household, the score decreased dramatically from 7.5 to -14.8. Of course, Ribena bosses will not only be concerned about the removal from shelves, but the impact this will have in terms of perception among the target demographic. YouGov Profiles Lite indicated that typical Ribena customers ‘sometimes let my children influence what I buy’. So will parents go elsewhere to placate their children? Or will they look at healthier alternatives? The development of this story will be a feature of the retail world in the next 12 months. If the ban spreads to other products in store, will those brands then look to produce healthier versions to win back their space on the shelves? And will other supermarkets follow Tesco’s lead should the policy prove to be popular among consumers, and especially those with children?